transcosmos aims to deliver high-quality support services to consumers in clients’ local countries whilst helping clients optimize their marketing initiatives, expand sales, reduce costs, and boost customer satisfaction. 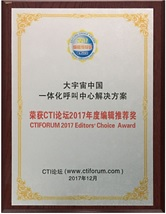 Shanghai transcosmos Marketing Services Co., Ltd., a wholly-owned subsidiary of transcosmos inc. was awarded the “Integrated Call Center Solutions Award” at the “CTI FORUM 2017 Editors’ Choice Award Ceremony” which was held in parallel with the “2017 CTI Forum Industry Applications and Market Analysis Theme Salon” hosted by CTI Forum on December 21, 2017. 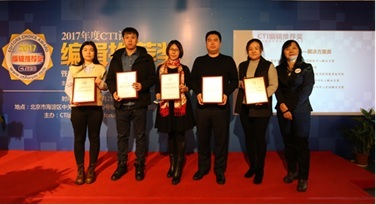 The selection and review committee of the “CTI FORUM Editors’ Choice Award” aims at facilitating information sharing in the ICT (Information Communication Technology) industry and offers an opportunity to discuss and exchange ideas on industry-related topics in order to promote the development of the industry. In 2017, hundreds of companies, industry experts and scholars in the ICT industry gathered at the forum and discussed the future development of the industry. The winners of the “2017 CTI FORUM Editors’ Choice Award” were selected from hundreds of companies after going through screening processes including “Self-nomination/Nomination + Experts’ review”. After the rigorous screening process, CTI Forum, a dominant Chinese online media company which offers information services, carefully selected outstanding ICT products, solutions, and experts in the industry based on its rich experience and powerful insights in the industry. Highly recognized for its excellent contact center outsourcing services, transcosmos won the “Integrated Call Center Solutions Award”. As a global BPO company, transcosmos continues to deliver high quality and highly productive outsourcing services to clients. To date, transcosmos has extensive experience and service record in diverse industries including the internet, 3C Industry (Computer, Communications and Consumer Electronics), IT manufacturing, finance, baby care, apparel, cosmetics, retail, auto, telecommunications, and more. transcosmos offers call center services with nearly 29,000 workstations across the globe to help clients globalize their businesses. Based on its proven experience in offering multi-language call center and customer support services across vastly different industries whilst managing the services in compliance with the international standards, transcosmos aims to deliver high-quality support services to consumers in clients’ local countries whilst helping clients optimize their marketing initiatives, expand sales, reduce costs, and boost customer satisfaction. Since transcosmos China launched its operations in Shanghai in 2006, the company has continued expanding its business, and now has as many as 8 service bases in 5 cities in China - 4 in Shanghai, 1 in Beijing, Tianjin, Hefei, and Changsha, as well as branch offices in Shenzhen and Taipei. transcosmos China offers extensive services such as e-commerce one-stop services including contact centers, digital marketing services, and system development services for over 80 prominent Chinese and global brands. transcosmos continues to support clients by offering high quality, high value BPO services. transcosmos launched its operations in 1966. Since then, we have combined superior “people” with up-to-date “technology” to enhance the competitive strength of our clients by providing them with superior and valuable services. transcosmos currently offers services that support clients’ business processes focusing on both sales expansion and cost reduction through our 170 locations across 33 countries with a focus on Asia, while continuously pursuing Operational Excellence. Furthermore, following the expansion of e-commerce market on the global scale, transcosmos provides a comprehensive One-Stop Global E-Commerce Services to deliver our clients' excellent products and services to consumers in 49 countries around the globe. transcosmos aims to be the “Global Digital Transformation Partner” of our clients, supporting the clients’ transformation by leveraging digital technology, responding to the ever-changing business environment.